If you often have visitors in the office, one of your biggest needs is for additional seating. Luckily, guest chairs are available that will give you the flexibility you need to seat any number of visitors, whether you are looking for something more formal or very casual, modern or traditional. One option is using something like a wooden office chair. This way you are able to get use out of the seating even when you do not have multiple visitors. A wooden office chair often has very simple lines, which means that it will not look out of place when you bring it out for use when the reception area becomes crowded. All of these options have their own benefits and drawbacks. Office sofas give a very casual appearance and can be quite comfortable. 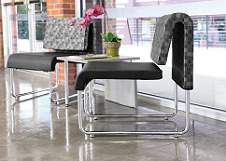 Lobby benches add the most reception seating while taking up the least amount of space. Stacking chairs may not be the most comfortable option, but are easy moved to provide the ample seating for the occasion. Contact us to learn more about our selection of guest chairs. Our sales associates can assist you in finding the perfect guest seating and you get with free shipping on every order.